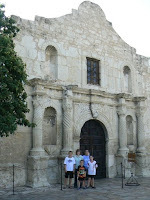 We left our hotel around 8:30 am this morning and headed downtown to the Alamo. 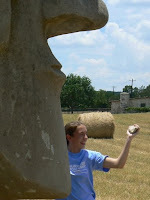 Jordan gave his report on the Alamo on the way there. We visited for about 1.5 hours and then walked around the surrounding area and the Riverwalk again for another 1.5 hours (shopping for souvenirs). We left San Antonio around 12:00 pm. We drove to Carslbad, NM. A trip of about 480 miles. Our Bible hour was Matthew 15-22. Our in-car movies were I, Robot and Benji. We got a little lost and endded up at Stonehenge. Not really. 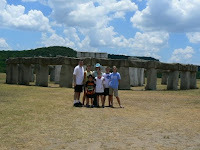 We stopped by Ingram, TX and visited Stonehenge II (Texas actually has two such replicas - the other is in Odessa). 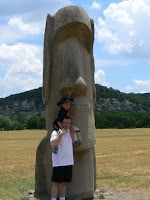 The kids not only liked the Stonehenge replica but the Easter Island Head replica - given the "Dum Dum" character in the "Night at the Museum" movies. We got pictures of Jedi picking his nose and Makaylah catching a "booger" when he sneezed. We drove for over 250 miles on I-10 towards El Paso - the speed limit is 80! We then spent a couple of hours on SR-285 which looks like nothing on the map but is 70 MPH, wide, flat and the most desolate road we have travelled for this trip. We came over one ridge and in the distance I could see a water tower. We measured it and it was 16.5 miles away - now that's flat and desolate! Finally got to Carlsbad, NM and had time for dinner, swimming and laundry. Some last minute "go to sleep!" to the kids while I write this and soon we should be in bed. It's 9:19 Mountain Time (first time Lisa or any of the kids have been in Mountain time) and we need to start our day around 5:00am so we can eat breakfast and leave the hotel by 7:00am. We head to Carlsbad Caverns first thing in the morning.